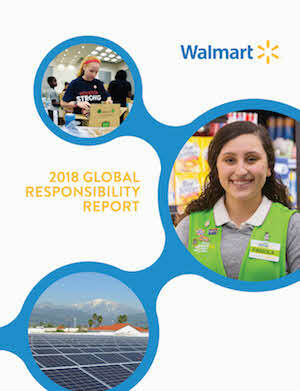 Walmart recently released its eleventh annual Global Responsibility Report (GRR), highlighting the company’s progress and accomplishments in fiscal year 2018 to increase economic opportunity, enhance sustainability of supply chains and strengthen local communities. To become the most trusted retailer in a way that creates value for business and society, Walmart works in partnership with suppliers, NGOs, thought leaders and elected officials to positively impact entire systems. Walmart aims to lead on the environmental, social and governance issues that matter most to customers, associates, shareholders and communities. Walmart has made significant progress towards ambitious goals set more than a decade ago including to be powered by 100 percent renewable energy, create zero waste and sell products that sustain people and the environment. The report highlights a number of initiatives including: significant investments in higher wages, training and increased parental leave for eligible associates; a collaborative initiative with suppliers across the value chain to reduce one billion metric tons, or one gigaton, of emissions by 2030 known as Project Gigaton™; and further collaborations with suppliers, nonprofit organizations and others to help combat forced labor in the global supply chain. Advancing Economic Mobility at Walmart: Walmart promoted more than 230,000 people to jobs of greater responsibility and higher pay in the U.S. in FY2018 with bonuses for hourly U.S. associates totaling more than $625 million. Fostering Inclusion: As of January 31, 2018, Women make up more than 30 percent of Walmart’s company officers and 55 percent of its total U.S. workforce. People of color make up 37 percent of U.S. management promotions and 44 percent of the company’s U.S. workforce. Supporting Retail Opportunity across the Sector: Through the end of FY2018, Walmart and the Walmart Foundation have invested more than $80 million of their $100 million Retail Opportunity Initiative in grants to programs aimed at making it easier for frontline workers to advance their careers in retail or adjacent sectors. Increasing our Renewable Energy Portfolio: Walmart has set a goal to be powered by 50 percent renewable sources by 2025, and has currently achieved an estimated 28 percent, putting Walmart on track to reach the goal. Reducing emissions in Walmart’s Supply Chain: Launched in 2017, Project Gigaton™ strives to reduce emissions from the collective value chain – Walmart’s supply chain and the supply chain of its suppliers - by a total of one gigaton by 2030. To date, more than 400 suppliers have signed on and within the first year of reporting, more than 200 of these suppliers reported emissions reductions that totaled over 20 million metric tons. Enhancing the Environmental Sustainability of Key Commodities: By 2025, all Walmart U.S., Sam’s Club, ASDA, Walmart Canada, Walmart Brazil, Walmart Mexico and Walmart Central America fresh and frozen, farmed and wild seafood suppliers will source from fisheries that are third-party certified as sustainable, actively working toward certification or engaged in Fishery Improvement Projects. Last year, Walmart U.S. and Sam’s Club achieved the goal of 100 percent certified for its wild-caught fish, and 98 percent through farmed fish, with the final two percent having plans in place to obtain certification. Providing Disaster Relief: Since FY2017, Walmart and the Walmart Foundation have provided more than $44 million in funding to support disaster response and preparedness around the world, which includes funding for the devastating hurricanes that hit the continental U.S. and Puerto Rico in 2017. Relieving Hunger: Since FY2015, Walmart has donated over 2.5 billion pounds of food from Walmart Stores, Sam’s Club locations and distribution centers in the U.S., including more than 675 million pounds of food in FY2018. Engaging Associates and Communities: In FY2018, Walmart associates volunteered more than 850,000 hours in the U.S., and the company’s U.S. stores and clubs provided more than $42 million in local grants. Supporting Veterans: Since Memorial Day 2013, Walmart has hired more than 200,000 U.S. veterans and promoted more than 28,000 veterans to roles of greater responsibility.